The world is full of 20-somethings, drifting around their parent’s house, trying to land that perfect job and discover their purpose in life. Bijou Rudolf (21 in doggy years) has no such trouble, Leigh Schaller investigates how this furry Labrador is making the world a happier place. Bijou looks on curiously as Jeanie smiles at her ridiculous, yet cute dog. For Bijou blue Mondays don’t exist. There is no need for morning coffee, no complaints about working too hard, or when the next vacation will be. As Jeanie Rudolph’s guide dog, Bijou seems to just get on with the job. If her tail wagging and hand licking is any indication, then Bijou has a high level of job satisfaction. When not marching with Jeanie to class at Stellenbosch University, or keeping her owner safe from reckless, phone-texting, drivers, Bijou hangs out at Harmony Female Residence. Here she is perhaps its most loved inhabitant. It is only in the last two years that Jeanie has had the company and help of Bijou in her world. Jeanie, was diagnosed as gradually becoming blind from around age 6, and may have benefited from a guide dog years ago, but that’s not how it works. “You only get a dog when you are done with school. Can you imagine a class of eight, with eight guide dogs? And then there is the maturity level and stuff. I waited until my 2nd year to get a dog and I applied in matric. There is a long waiting list,” explains Jeanie. It is not the Opera show. Everyone doesn’t get a dog. Instead, for wonderful canines like Bijou, there is strict process where interviews are held and circumstances are checked to make sure that the animals don’t go to couch potatoes and that the new owners will have the means to look after them. Bijou shares the fate of world class gymnasts and Korean Pop stars, in that her training to become a guide dog started at a very young age. “They start with their preparation or conditioning training for about 7 weeks, then for about a year they will stay with Foster parents, we call them puppy raisers. 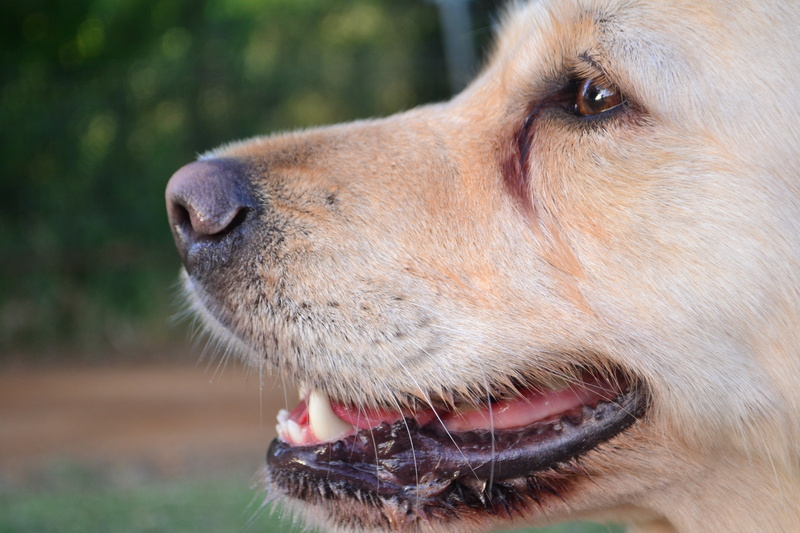 They will stay with them from 7 weeks up until 12-14 months,” according to Pieter Van Niekerk, the marketing manager for the South African Guide Dog Association (SAGDA). They train up to twenty guide dogs in South Africa annually. “The dog will come into its formal training for guide or service dog training that will take up to 7 months, which means that the dog is ready to be trained with his or her client from 18 months to two years,” says Van Niekerk. For Jeanie, this meant that although she applied for a dog in matric, she could only go and train with Bijou two years later. 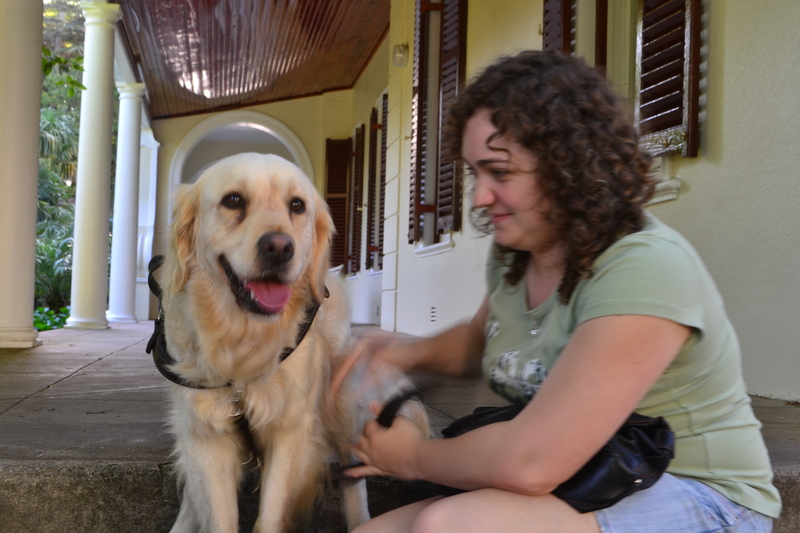 Guide dogs are trained to be obedient and professional. As such Bijou isn’t fazed by other dogs. Her tail remains calm and she is aloof when approached by stray hounds, whose owners have been negligent in leashing their animals. Yet deep underneath her furry coat, an inquisitive playful side of Bijou makes the occasional appearance. Bijou and Jeanie’s walk to the Coetzenberg may come to a temporary halt as a squirrel, an animal that is the kryptonite of Bijou’s monk-like focus, dashes up a nearby tree. “Bijou, leave the squirrels,” says Jeanie in a semi-stern, completely amused tone as she yanks the harness and they proceeds along the pathway. Bijou’s obedience and competency comes at a cost. According to Van Niekerk, it takes up to R 80 000 to train one dog. This would make Bijou almost as expensive as Jeanie’s BA degree, but because of SAGDA’s noteworthy donor system, the cost was minimal. Everywhere that Bijou and Jeanie walk, they are treated with a certain celebrity like status. The usually impatient Stellenbosch drivers actually stop at intersections where drivers wave (presumably to Bijou) so that the pair can cross. A coffee shop owner will bring out a bowl of water so that Bijou can feel comfortable and the pair is told to come again, and to do so soon. Despite this, ignorance does persist. 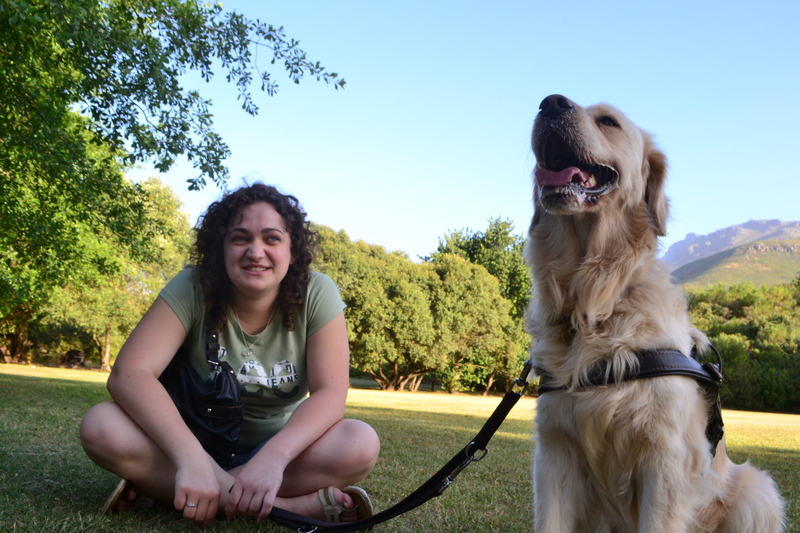 Two years ago a Macdonalds’ branch in Pretoria asked a woman and her guide dog to go and sit outside because of their no-dogs policy. Although Macdonalds later apologised, the incident highlighted that much still needs to be done. In a similar hard to believe incident, Bijou and Jeanie were once refused entry to a flat-complex in Cape Town, by the security guard. He asked Jeanie to prove that she was blind. “How on earth do you prove that you are blind? You can’t walk into something, because you could fake that,” says Jeanie. In the US, a study is currently underway in which the dogs are put in an MRI scanner and their brain activity is observed. An article by the New York Times says that early findings indicate that dogs experience emotions in a very similar way to humans. No-one needs the New York Times or a US university to prove the shared emotions that Bijou and Jeanie have for each other. Maybe in another life Bijou could get a role in Hollywood, or settle for being a regular pet, but it seems that this 20 something is more than happy with how life is panning out.